Billy Bubble is ready to burst! The excitement of finally being out of his bottle on a beautiful, sunny day is everything he's hoped for. But someone else has bigger plans for Billy. The green-eyed girl with the bubble wand has a special message that needs to get to heaven pronto. Billy's secret mission through the dangers of the sky - pointy branches, bird beaks, oh my! - will bring him before God, where he'll learn an important lesson about God's love and compassion. Join Billy Bubble on his journey of faith, and discover the power of prayer for yourself using the helpful prayer journal in the back of this book! Keep track of your prayers and see how God answers each of them as we live our lives for Him. Our Heavenly Father knows every hair on our heads, every bubble in the sky, and every prayer we offer with a sincere heart. Shelly Roark wanted to grow up and become Wonder Woman. When that didn't pan out, writing stories became her passion, and her career in journalism found her writing for newspapers and non-profits, like Focus on the Family, American Bible Society, and World Help. She's the wife of a high school history teacher and mom to three teens, but she's also been a clown, a ventriloquist, and a puppeteer. 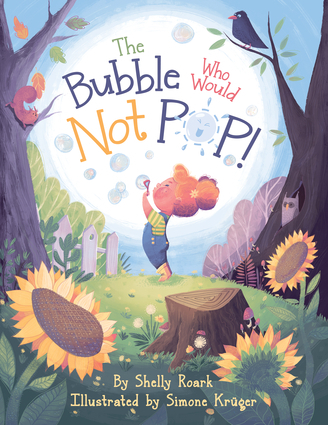 The Bubble Who Would Not POP! is her debut children's picture book. Simone Krüger is a German-Based, self-taught illustrator. Originally employed in graphic design, she made the leap into full-time illustrating at the start of 2017 and couldn't be happier! She's a proud nerd who loves video games and reading comics. She also loves being out and about in the countryside, discovering nature and new creatures to draw. However, her biggest passion is creating beautiful artwork for inspiring projects.